Home > Modular Dispensing Systems > Creamer Dispensers > Tomlinson 1004005 5500-SS Dairy Creamer Disp. Tomlinson 1004005 5500-SS Dairy Creamer Disp. Tomlinson 5500 DAIRY CREAMER DISPENSER is a fantastic product designed to assist you in serving ice-cold dairy creamer packets. The dispenser maintains 40°F temperature for up to 8 hours with the re-freezable cold packs. Moreover, Tomlinson offers the Dairy Creamer Dispenser in brushed stainless steel as well as beige polyurethane color. The dispenser is supplied with two re-freezable cold packs. However, a broad range of optional accessories like Top Coffee Service Organizer, Stir Stick Inserts, and additional refreezable cold packs are offered to enhance productivity and overall control of everyday dispensing. The dispenser has a capacity to store around 300 creamer packets. 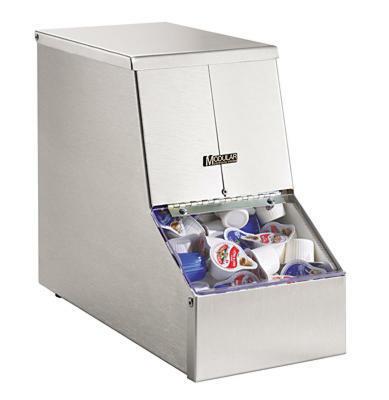 Get your pick of insulated Dairy Creamer Dispenser from Tomlinson today. Tomlinson Lid, Straw, Condiment and Napkin Dispensers from MODULAR DISPENSERS collection are a fantastic solution when you need optimal control of various dispensing essentials. In fact, products and solutions from this class represent profound integration of cutting-edge technology to meet various demanding requirements. Tomlinson offers exclusive solutions like Air Pot Stations, Tubular Adjustable Lid Dispensers, Countertop Adjustable Lid Dispensers, Domed Lid Organizer, Straw Dispensers, 1200 High Volume Condiment Dispenser, 5500 Dairy Creamer Dispensers, 6000 And 9000 Condiment Dispensers, and In-Counter/Counter Mount Napkin Dispensers to respond dynamically to a broad spectrum of dispensing requirements. In fact, products from this class certainly assist you in attracting customers and rather enhancing profitability. Moreover, these Tomlinson solutions require much lesser space assuring a swift and tight integration in virtually every instance of installation. Selecting any dispenser from the collection indeed is a value addition you can count on. Get set to reveal the true potential of these next-Gen products to simplify criticality of dispensing whilst allowing you to enjoy the best the industry has to offer. Tomlinson subtly has a capacity to transform the world around you making it more productive, delivering, and enticing. Count on Tomlinson for smart Lid, Straw, Condiment and Napkin Dispensers and enjoy the timeless performance at the highest affordability. Tomlinson 1004002 5500 Beige Dairy Creamer Disp.